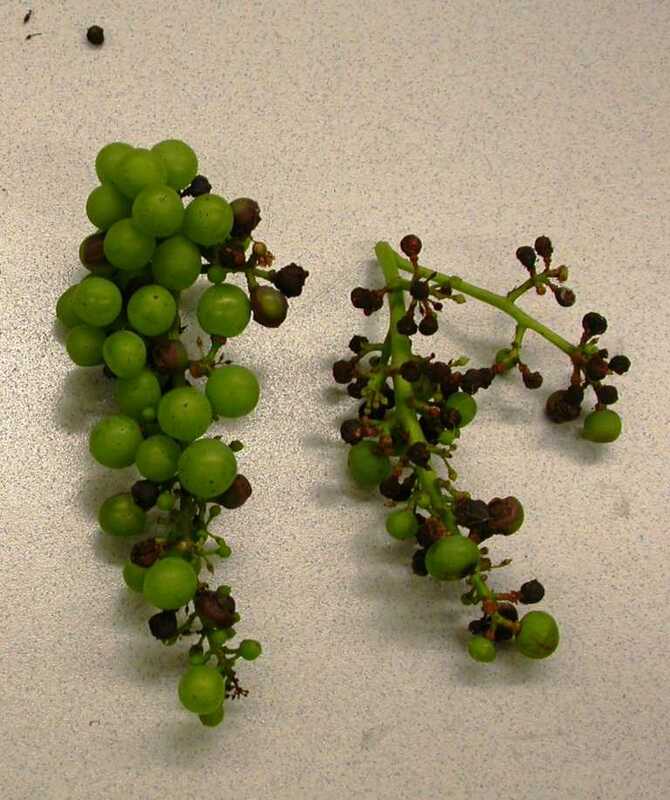 Black rot, caused by the fungus Guignardia bidwellii, is a serious disease of cultivated and wild grapes. The disease is most destructive in warm, wet seasons. It attacks all green parts of the vine – leaves, shoots, leaf and fruit stems, tendrils, and fruit. The most damaging effect is to the fruit. 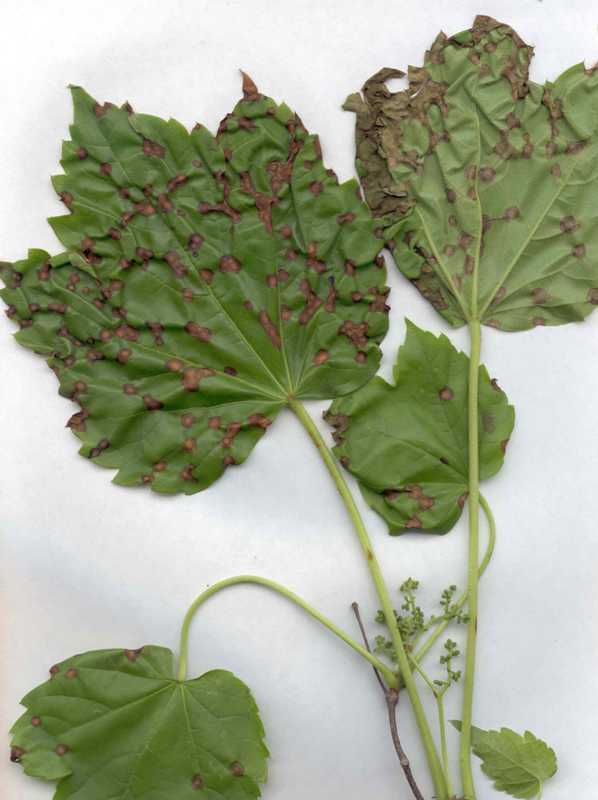 Note: Guignardia bidwellii forma parthenocissi causes a leaf spot on Boston ivy and Virginia creeper. Control is as for black rot of grapes. 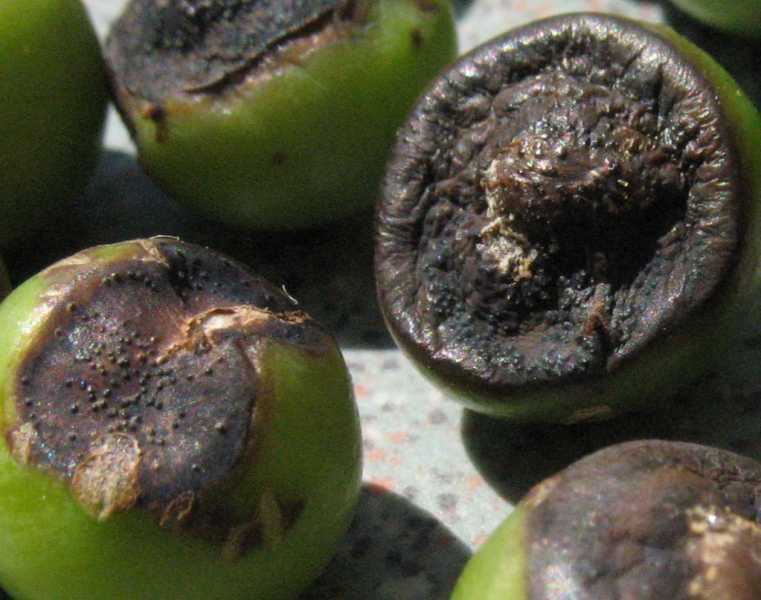 Warm, muggy weather in the spring and summer, along with unsprayed fruit of susceptible varieties, may cause fruit to become almost completely rotted by harvest time. Black rot is not difficult to control if good cultural practices are followed along with the use of protective fungicide sprays. Leaves: Reddish brown and circular to angular spots appear on the upper surface of the leaves starting in late spring. As spots merge, they form irregular, reddish brown blotches. 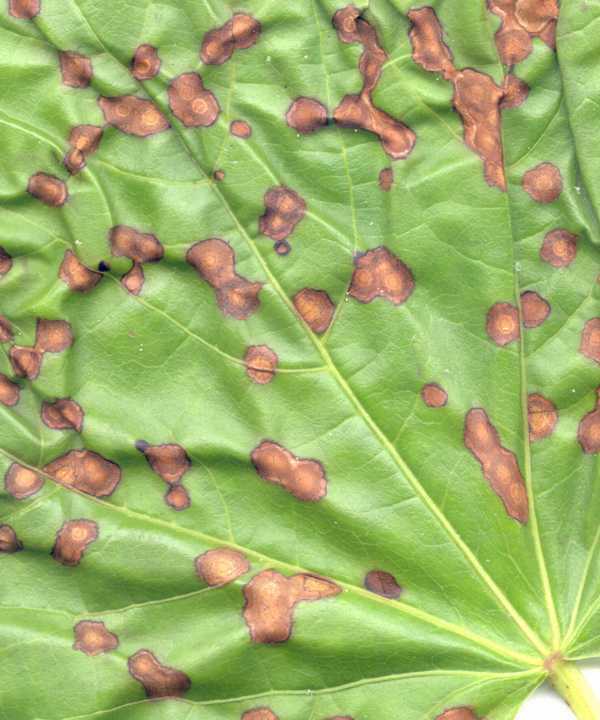 The number of spots or lesions per leaf varies from 2 to more than 100 depending on the severity of the disease. The center of the leaf spot turns tannish brown and is surrounded by a black margin. Black, speck-sized fruiting bodies (pycnidia) are arranged in a definite ring just inside the margin of the lesion. Only young, rapidly growing leaves are affected. Fruit: Shortly after the flower petals fall, fruit infection can occur. Most infections start when the fruit is half to almost full size. A small spot will appear that becomes circular and whitish tan, often surrounded by a brown ring. This happens while the berry is still green. The spots grow rapidly and may cover half of the berry within 48 hours. Within a few days the entire berry becomes coal black, hard, and mummified. The surface of the withered fruit is soon covered with minute, black, pimple-like, sporeproducing pycnidia that are arranged in circular zones. 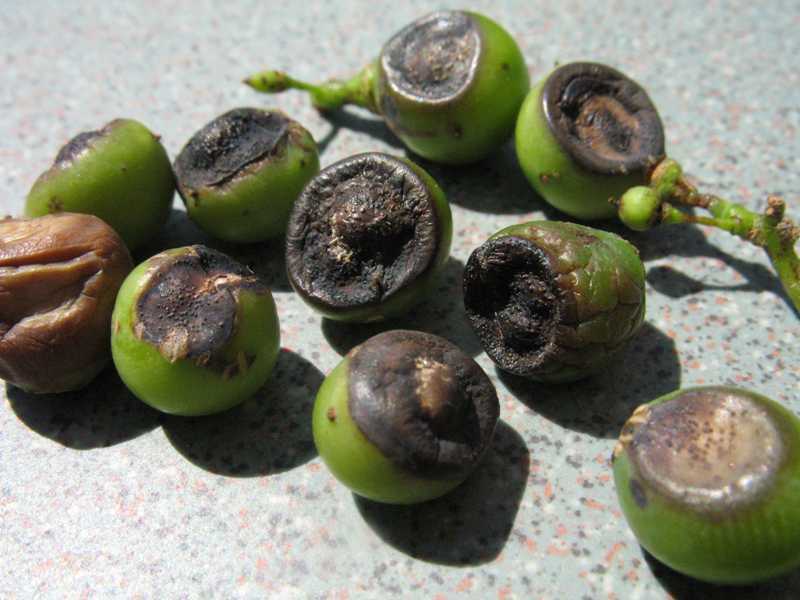 The black rot fungus overwinters in canes, tendrils, and leaves on the grape vine and on the ground. Mummified berries on the ground or those that are still clinging to the vines become the major infection source the following spring. During rain, microscopic spores (ascospores) are shot out of numerous, black fruiting bodies (perithecia) and are carried by air currents to young, expanding leaves. In the presence of moisture, these spores germinate in 36 to 48 hours and eventually penetrate the leaves and fruit stems. The infection becomes visible after 8 to 25 days. When the weather is wet, spores can be released the entire spring and summer providing continuous infection. Cool weather slows growth of the fungus. It requires warm weather for optimal growth and a period of 2 to 3 days of rain, drizzle, or fog. New black rot infections continue into late spring and summer during prolonged periods of warm, rainy weather. During August, the pycnidia are transformed into the overwintering stage (pycnosclerotia) that gives rise to perithecia within which the spring ascospores are produced, completing the disease cycle. 1. Planting. Space vines properly and choose a planting site where the vines will be exposed to full sun and good air circulation. Keep the vines off the ground and insure they are properly tied, limiting the amount of time the vines remain wet thus reducing infection. 2. Sanitation. Keep the fruit planting and surrounding areas free of weeds and tall grass. This practice will promote lower relative humidity and rapid drying of vines and thereby limit fungal infection. 3. Pruning. Prune the vines in early winter during dormancy. Select only a few strong, healthy canes from the previous year’s growth to produce the following season’s crop. Remove these prunings from the vineyard and burn or destroy. 4. Cultivation. Cultivate the vineyard before budbreak to bury the mummified berries. 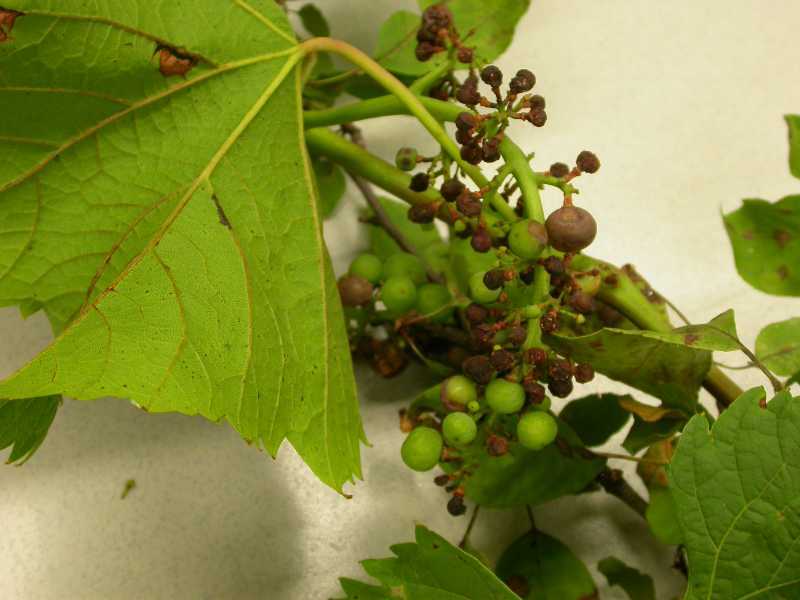 Diseased berries covered with soil do not produce spores that will reach the developing vines. For homegrown grapes, use 2–3 inches of leaf mulch or fine bark to cover infected debris. 5. Fungicides. Use protective fungicide sprays. Pesticides registered to protect the developing new growth include copper, captan, ferbam, mancozeb, maneb, triadimefon, and ziram. Important spraying times are as new shoots are 2 to 4 inches long, and again when they are 10 to 15 inches long, just before bloom, just after bloom, and when the fruit has set. 6. Cultivars. Cultivars with large, juicy berries are the most susceptible. In general, grapes that ripen late in the season are affected the least. Most commercial cultivars are sufficiently resistant if adequately protected with a fungicide spray program. ‘Baco #1’, ‘Cascade’, ‘Cayuga White’, ‘Chancellor’, ‘Chelois’, ‘DeChaunac’, ‘Elvira’, ‘Missouri Riesling’, ‘Norton’, ‘Vidal 256’, and ‘Verdelet’ are varieties which are moderately resistant. Strategies 1, 2, 3 and 4 are strictly organic approaches. Of the fungicides listed in Strategy 5, consult the Organic Materials Review Institute (OMRI™) for appropriate organic copper products.